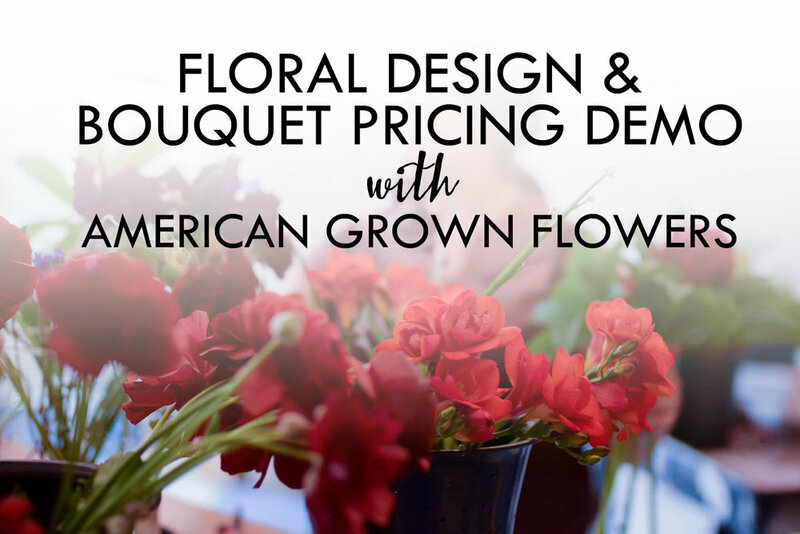 In honor of American Flowers Week, let’s talk about getting some floral designers a chunk of the good ‘ole American dream. I was in the middle of a ‘how-to-scale-a-drawing’ demo I was building for a Curious Lola Education Series when I received yet another email from one our designers in our inner circle. I guess I knew this since I’d heard it before. I hire a lot of new business owners to help with my bigger projects. Inevitably, the conversation veers toward money. Until now, I’ve stayed away from giving money advice. It’s complicated, it’s emotional, and it’s personal. Until now, all I could tell them was… find out how to be profitable and do that. Equal parts science and art, pricing is as much a positioning strategy as it is an operational necessity. What works for me will not work for you, and in that way, no industry standard, no formula is going to solve anybody’s problems. I believe that all business procedures and structures, if we are reasonable, honest people, are solely an agreement between the business owner and the customer. Each have to agree upon a value for the exchange. What that value happens to be is sort of wishy-washy. Even still, there is one thing a business must do. It must support your needs as a business owner, your honest and reasonable needs. And it must have the potential to meet your noblest desires. The ones that allow you to make this world a better place. Without the practical support of your business for you, eventually you will burn out- or it will no longer be financially feasible. Flower folks are some of the kindest, passionate, and empathetic people I know. You care about things that ‘normal’ people overlook. Your work is one of the best ways I can think of to bring people that transformative connection to the earth that is so rare and needed. Flowers = gifts to us from the Earth. The point is, these are the people whose noblest desires are most likely some of most important work that can be done. These people should NOT fail. But they are also people who tend to undervalue. I want you to make money. And I’m okay with that being a lot of money- you should be too. So, today we are working on that. We are building this into a course launching this summer. If you want to be among the first to know when it launches, click the link here (and there’s a cool freebie). Just like any engineering feat, pricing and profitability can be figured out. While I have figured it out for my company, those particular metrics are not best for your company. What I CAN do is show you how to understand YOUR company, what it needs, and design a set of pricing standards and metrics to ensure that you are supported. I can show you how to remove the uncertainty around money. The only struggle left will be to be confident in the value you provide- and to ask for what you need. The foundation is to understand what your costs are (all the costs) and multiply it by an X factor that will cover your company's needs. We’ve put together a demo for a very intimate wedding and are sharing the pricing info. Be sure to click the link in the bottom for the full pricing report, ridiculous behind the scenes video of our team, and what our final invoice would be to our client. 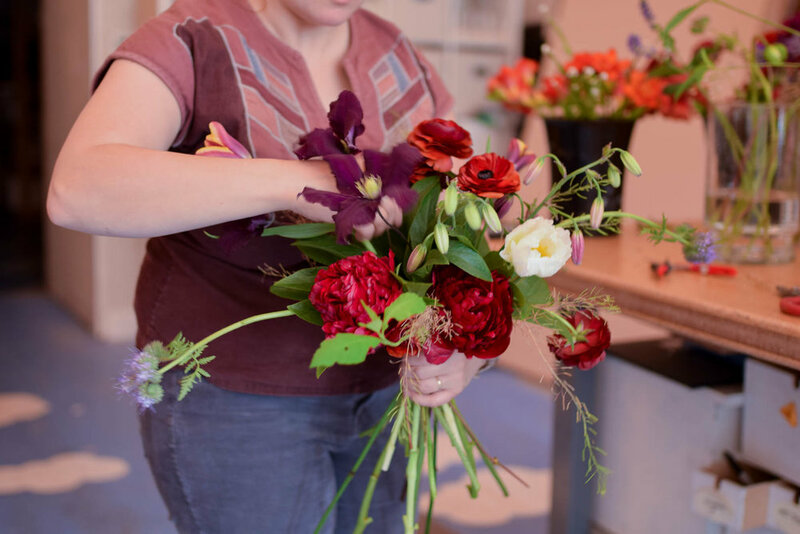 In celebration of American Flowers Week, we’ve selected all US grown flowers from our local Seattle Wholesale Grower’s Market and in a red white and blue (ish) color palette. First, we select a flower recipe we want to work with. 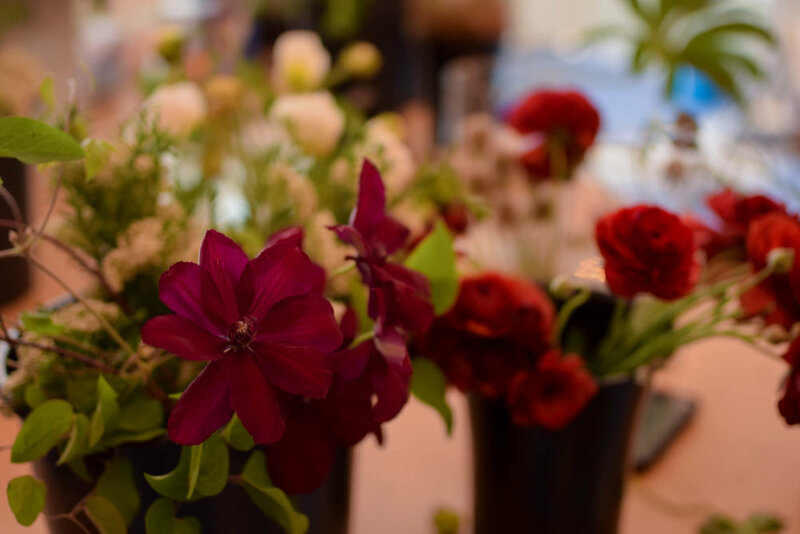 We keep a recipe of most of our floral designs and transcribe them into the following format so that a similar style can be achieved in any season- regardless of what flowers are available. The flower costs are averages and are updated seasonally or yearly. Want help growing your biz and learn new floral techniques? 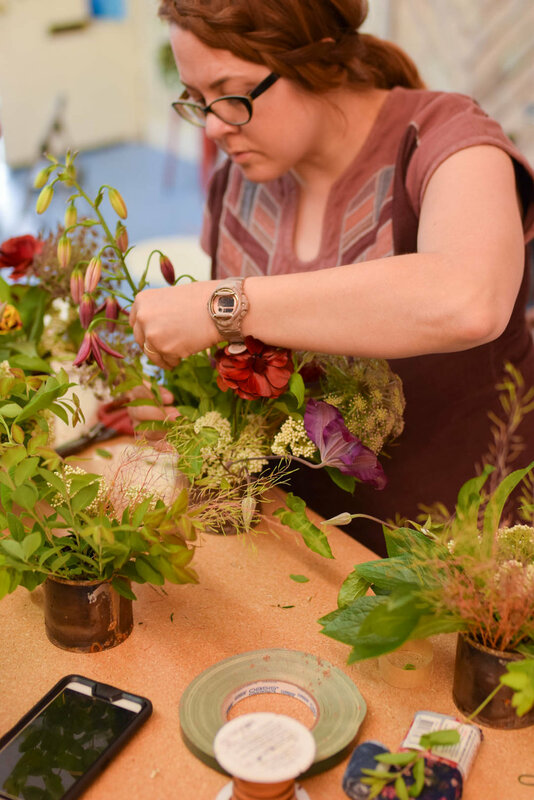 Join our community of floral designers! This might seem like a weird method, but once learned, it’s really very useful to keep from overbuying. The Types of Flowers fall into how they are used in an arrangement and by average cost. I’ve included a breakdown of what all these types are in the link if you want more information. Here’s the thing… It doesn’t matter. Overbuying this 1 arrangement doesn’t matter and your markup doesn’t ensure you are covered. Read on to find out why… and what DOES matter. I ended up spending $259.80- so yay for me and/or my client. (Eh, A $9.00 bunch was an impulse buy that is on my dining room table). So we’ll say 250.00 for this client. So if I were using just markups, I might charge this person 250 X 3.5 then maybe some sort of design or installation percentage, yes? I’ll use a typical scenario that I’ve found designers are using. I’ll mix a flower markup and percentage of retail order for design and delivery/ install. I’ve found that 3.5X flower markup, a 20% add on for design AND a 40% delivery/ install fee would NOT be enough here- yet I have a hunch that many of us would even charge both percentage add-ons. $875 for the bouquet, boutonniere, 5 little centerpieces, and a bodacious large arrangement. This seems reasonable and maybe even a stretch for some of you, but if I were to keep this sort of pricing up, I would find myself at the end of the year with LESS than I need. I would wonder where the money went. I might event start to resent my work or clients. This structure doesn’t cover all the other things in my company. Thinks like operations costs, taxes, profit, marketing expenses. I know this because of Price and Profit Design. This means that every single thing I spend money on in order to get a job done MUST be multiplied by at LEAST 2.5 in order to make sure I am in my happy place. Every single cost of goods must be multiplied by 2.5 or I am not on my way to achieving a sustainable company let alone any noble dreams. This doesn’t mean YOU need 2.5X, just me. Yours will be different. X factors differ because we all do our business a little differently. Our local markets and costs for flowers are all a little different too. That may seem low for flowers but what about gas? Or parking? Or the lunch you bought your crew, or the time you had to pay your assistant to sit at the hotel and wait an hour for the bride to arrive so you could give her your bouquet. Or your time cleaning up afterwards? And let’s not forget your time- period! Those are still costs of goods- and not in the way your accountant defines them. Just in the common sense way that if you didn’t have a job to do, you wouldn’t have incurred the expense. For our little demo event, let’s say we need to drop the bouquet off at a hotel before heading to their cute venue in order to place the little centerpieces, big arrangement, and give our groom his boutonniere. Then we’ll come back at ridiculous-o’clock to pick up the rental vases. Here’s what my cost of goods looks like for this job. Let’s assume that I’ve determined I need a minimum of 45.00 an hour as lead designer and my assistant or driver makes 20 an hour (out of my pocket after payroll taxes). Sometimes I charge the lesser rate for my time while getting to/ from places. But, if it’s not YOU doing the driving, then you are paying someone- so must include those costs. So my total cost of goods for this job is $700 which means that in order to cover myself, I need to charge my client $1750.00! If I had gone with the previous structure, then every little job I have like this, I’d be having little money piranhas biting away at my financial health. If I gave that number to a potential client and they couldn’t do it, I might suggest that I don’t deliver the bouquet separately, or that they return the vases the week after their wedding. Or that one of their friends comes and picks up the arrangements (don’t recommend). I might suggest a less expensive bouquet or large arrangement. Whatever the cost savings measure is, it must somehow reduce my cost of goods in a significant enough way. Or, if they don’t think that the value they are getting is worth their money, or if I don’t think I can give them what they want for the money they want to pay, then I may suggest I am not the right fit for them. The fact is, taking less than what my X factor deems necessary is undervaluing my talents and not supporting my honest and reasonable needs for the business I am trying to build. It makes an otherwise wishy washy situation very clear. Click here and download the Recipes and Invoice Demo! And if you want to find out YOUR specific X Factor and design YOUR pricing structure, join us when Price and Profit Design launches. Details to come! Click the link above to be notified when doors open.